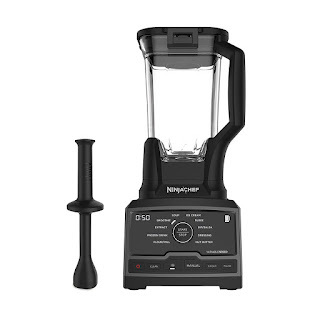 Today only, while supplies last, get this Ninja Chef Countertop Blender with 1500-Watt Auto-iQ Base, 10 Pre-Sets, 10 Speeds, Dishwasher Safe 72-Ounce Pitcher, and 50 Recipe Booklet for ONLY $99.99 (Retail $199.99)! The Ninja Chef Blender features a 1500-watt advanced motor system, next-generation high-speed blade design, and Ninjas widest variable speed range, designed to power through tough ingredients and avoid bogging down. Choose between the 10 pre-set Auto-iQ programs or switch to Manual mode for total variable speed control from 7,000 to 18,000 RPM. * The Ninja Chef is designed especially for you, kitchen experimenter, to turn that home-cook inspiration into real chef-quality results. * *RPMs measured at free load. The 1500-watt advanced motor system with next-generation blades is designed to power through tough ingredients and avoid bogging down.